Brandpa allows sellers to transfer domains to each other. Please read our important rules for transferring domains first. To transfer a domain that you own, go to the Listed tab in your seller’s dashboard, and click Transfer next to the domain you want to transfer. You’ll need the email address of the recipient, which has to be an existing Brandpa seller. 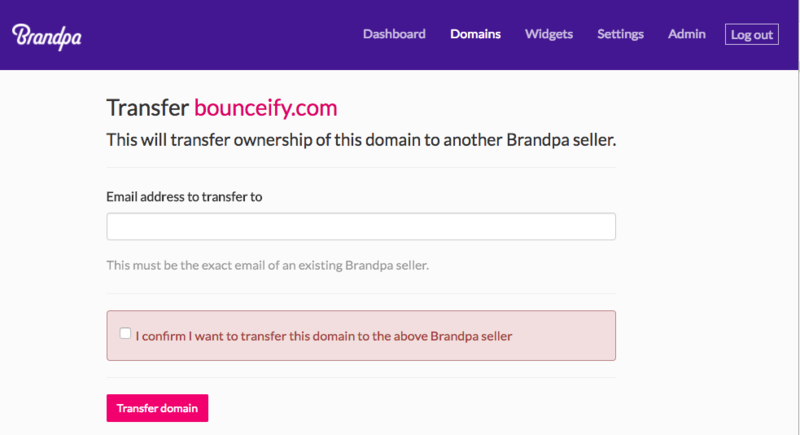 You can only transfer a domain that is currently publicly on sale on Brandpa. This means you cannot – for example – transfer a domain that you have not yet paid for, or a domain that has been removed for any reason. Why do we reject domains for similar trademarks?